B U B B L E G A R M: Pomegranate for the skin? Pomegranates are full of nutrients and energy, loaded with essential amino acids, vitamins B, C and other antioxidants. I ate some today, and wondered what it it would be like to apply some externally to my skin. I started to get creative and managed to give myself a facial with my DIY recipes. 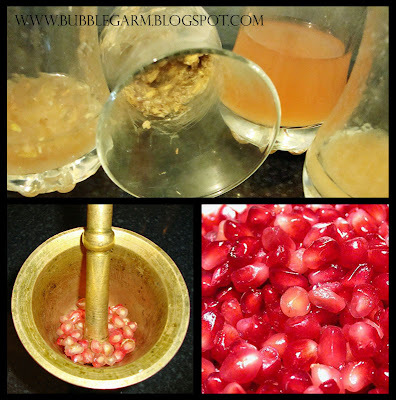 Check this video HERE for easy peeling of the pomegranate in water, so quick and easy!! I made an exfoliator, face mask, toner and moisturiser. Listed below are the ingredients I used. I only made a little bit, enough for 2-3 uses. Shelf life, not very long I'm assuming! Moisturiser: Sprinkle of crushed and filtered (juiced) pomegranates, 4 tbs of almond oil and one drop of avocado oil. (Applied with fingers whilst patting into the skin) - Surprisingly, my face wasn't oily, I only added a very thin layer and my skin absorbed it right up. What did I think? I really enjoyed the whole process of making the formulas from start to finish, I'm all for natural ingredients and love the fact that I know exactly what's going on my face - no nasty chemicals! *yay* :) My skin felt fresh, calm and looked like it was glowing after my DIY facial, what a treat! I used almond oil because of it's vitamin e and the fact that it's great for dry skin. I don't suggest you go and try this in a hurry, as it's only the first time I tried these particular ingredients together and don't know if it will break me out, I highly doubt it but you never know. But hope I inspire you to be a little creative in the kitchen and make your own little formula, Next time when your eating your fruit, apply some to your face maybe? :) Why go out spending lots of money on "natural" products when you can make your own? I felt rather proud of the outcome. Next on my list is to make a homemade rose toner! i always drink pomegranate tea because it taste good and is good for our skin. Pomegranate is delicious...thanks for the link to how to peel it easily. Mash'Allah,your talent is infinite.How wonderfully creative,I love your 'healthy inside shows on the outside' approach.you may like to check out some BRIAN TRACY on you tube etc cause there's a 'wholesome-mind' aspect to this too...i.e. to think,eat,feel and look great.there's also a site consciousmedianetwork,where they feature alternative remedies,for various ailments with NO side effects .Thank you for always being inspiring. Hi Bubble! I love these DIY recipes for the skin, I think it is a really good idea to start worrying seriously about what we put on our skins and also use what the Mother Earth has ready for us. I wish your treatment works wonders. Yesterday in Tescos they had a lot of Indian face washes and one of them was pomegranate and something. I would have bought it but it was priced at something like £6 when I have seen it in the Indian shops for a lot less. My mum also has some pomegranates at home so I'm going to try this recipe tomorrow. how funny! I am actually drinking pomegranate juice right now! I love it!